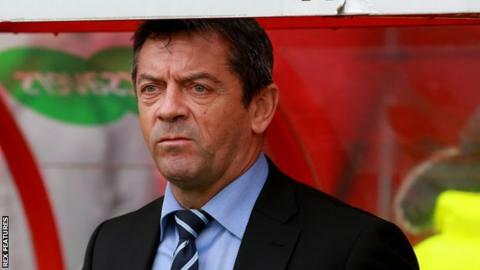 Southend boss Phil Brown kept his team in the dressing room for two hours after losing at Swindon and is hoping his "high-risk strategy" will pay off. The Shrimpers squandered a two-goal lead as they went down 4-2, their third straight defeat in League One. "Harsh words have been spoken and will continue to be spoken for the next five or six days until we can put it right against Peterborough," he said. Southend are eighth in League One, three points off the play-off places. They have suffered a drop in form with heavy defeats by Millwall and Doncaster preceding Saturday's loss. "We squeezed the living daylights out of them for the first 30 minutes then took our foot off the gas having gone 2-0 up," Brown told BBC Essex. "That's the questions I asked in there, why we did that. I've got some answers and we'll be utilising those answers on the training ground." He continued: "We've got decent lads in there, and they're telling me they're hurting but they can't be hurting as much as I am at the moment. "Shipping 11 goals in three games is not something I take too kindly to, but we weren't at the races in the second half and Swindon won fair and square." Despite his anger at the defeat, Brown believes his side have risen to the challenge of playing in League One after winning promotion via the play-offs last season and will do so again at in-form Peterborough, who are two places and three points above his side. He added: "It's away from home and the travelling support will come again because I would say they're half-pleased with where we are in the division as some people thought we'd be cannon fodder for a relegation - that isn't the case but we need to arrest this situation."